A distraught Marine suffering from post-traumatic stress disorder finds solace in a comic book in our exclusive clip from The Submarine Kid. Finn Wittrock stars as Spencer Kroll, who can't escape the horrors of three tours in the war. Through a new relationship with the mysterious Alice (Emilie de Ravin), and the discovery of a story dubbed The Submarine Kid, Spencer goes on a unique journey in this drama from MarVista Digital Entertainment. The Submarine Kid is available on Digital HD and On Demand January 12, with star Finn Wittrock making his writing debut, co-writing the script alongside his director, Eric Bilitch. The feature also stars Jack Coleman, Nancy Travis, Jessy Schram and Matt O'Leary. The Submarine Kid is a timely film that takes a unique look into one Marine's journey through wartime post-traumatic stress disorder. Military veterans worked in front of and behind the camera lens to create the arresting drama, including Technical Advisor Jon Barton, Stunt Coordinator Matt Anderson and actor Scott Levy as Sgt. Barton, along with a host of amazing extras. The film was an official selection at the Napa Valley Film Festival in 2015. It will be available on Amazon, Comcast Xfinity, Google Play, iTunes, Vimeo and VUDU, as well as On Demand with AT&T, Charter, Comcast, Cox, TWC, Verizon and Vubiquity. 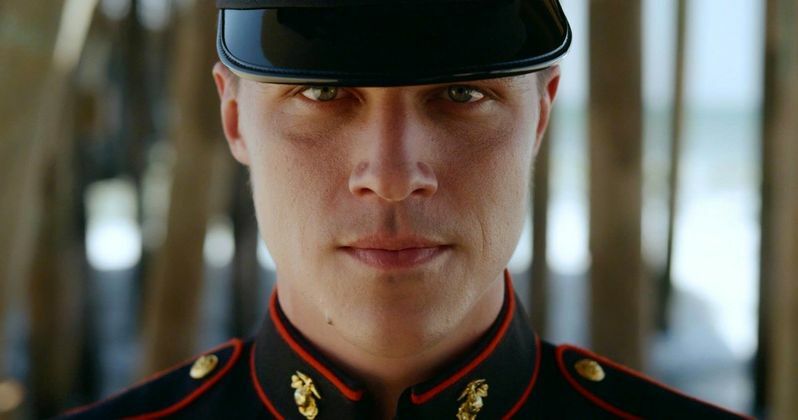 The Submarine Kid follows Spencer King (Finn Wittrock), a U.S. Marine who has just returned home from his third tour after a difficult wartime experience. He struggles to acclimate himself back into civilian life with his family, friends, and his girlfriend, while he also deals with being haunted by an event from the battlefield. However, when he meets a mysterious woman (Emilie de Ravin) who fully captivates him, they escape into an entrancing relationship. His bond with this woman provides Spencer a new focus in which he can withdraw, creating a destructive situation from which only Spencer can save himself. The Submarine Kid also marks the feature directing debut of Eric Bilitch, who had previously written and directed episodes of Professional Friend. Will you give The Submarine Kid a shot on VOD or Digital HD formats this week? Take a look at our exclusive clip from The Submarine Kid, and let us know what you think.